I listen to a lot of podcasts. They keep me in touch with what’s happening in the US and UK. I recently suggested to the team at WNYC’s Freakonomics Radio that they look into Japan’s weird housing economics. They liked the idea and did some research. You can listen to the episode below. Listeners might be left wondering what about the role of financing? Japanese people, like everywhere else, typically take out a mortgage to buy or build a new home. But when the home’s value quickly depreciates, owners still have to repay the original value of the loan. During the Great Recession, many US homeowners also found themselves in this situation – it’s called being underwater. A significant number of borrowers (particularly the un-creditworthy ones) came to the conclusion that it would be simpler to cut their losses by defaulting on their loans and handing their house keys back to the bank. The banks were left trying to recoup their losses by selling these depressed assets. Why don’t Japanese homeowners just do the same? Well, there’s a big difference between home financing in the US and Japan. Those mortgages in the US were non-recourse loans. This means that if you don’t make your mortgage payments, the bank has no other recourse but to repossess the collateral, which means foreclosing on the home. In contrast, Japanese mortgages are recourse loans. Banks have recourse not only to take the home, but also personal assets (cash savings, cars, other property, etc) to repay the original loan amount. The Japanese homeowner doesn’t have the option to walk away from a loan they can’t repay. They’re the ones left holding the depressed asset. Japanese businessmen – or salarymen – are famous for the incredibly long hours of work, much of it unpaid overtime. The Japanese language even has a word for death by overwork: karōshi (過労死). 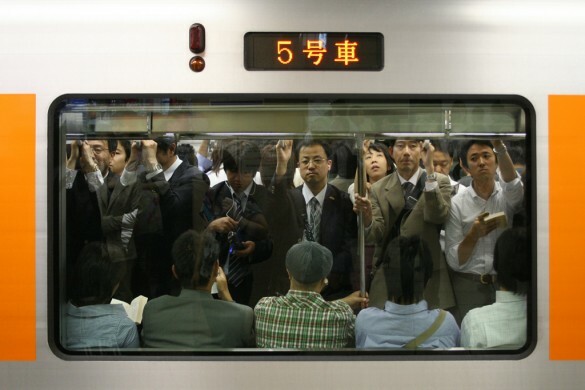 When I see crowds of men and women in identical suits packing themselves into commuter trains like sardines every morning, it makes me sad to think about what they will spend their lives working for. To get a mortgage in Japan requires a salaried job. Most of them will work at that job to pay off their mortgage and keep a roof over their families’ heads. By the time they finish paying it all off in 20 to 30 years, their home will be worth nothing. No wonder the Japanese are such big savers, preferring to keep their money in savings accounts, rather than reinvesting in their homes, this building upon wealth. Only their land can be resold, but prices have been dropping since the housing bubble burst in the early 1990′s. Won’t you take a moment to pity the poor Japanese salaryman?